One of the owners of a taxi company in Bandung, West Java, Indonesia has gone on to great lengths to prove to the world that an eight-wheeled Vios isn't as unorthodox as it seems. For Rony Gunawan, one of the owners of a taxi company in Bandung, West Java, Indonesia, a traditional sedan is nothing but boring. He has long held to this belief so strong that he finally did something about it, on one of his sedans, that is. Just months after the two-faced Toyota Vios (called Toyota Limo in Indonesia) went viral in 2018, another modified sedan is now gaining some interesting buzz from the automotive grapevine yet again as Gunawan has made another creation. This time around, his concept is definitely more game-changing. Gunawan is revealed to have engineered an eight-wheeled Vios, with six wheels on its rear and another two on its front. The concept was taken directly from the 2013 third-generation Vios, which was then used as a taxi fleet. The native from Bandung also revealed that the process of modifying the eight-wheeled Vios started on August 29, 2018. And although it's already been months since it was incepted, he shared that there's still a lot to be done, specifically with its interior. As per the difficulty of making an unorthodox sedan, Gunawan pointed out that the challenge certainly piled on when he was attempting to engineer the vehicle's rear wheels as the usual sedans would only come with two wheels on its back. 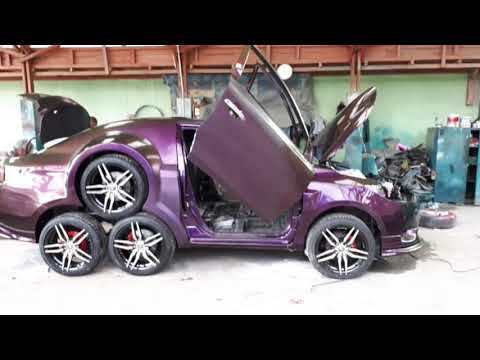 His finances have also been challenged as he's trying to complete the eight-wheeled sedan's modifications. According to Gunawan, it already costs him around IDR 80 to 90 million or around PHP 300,000 to 330,000 which doesn't include the expenses yet that are about to be made for its interior. But when everything else is considered, the costs to modify such an automobile feat is almost as priceless as it is fulfilling. After all, Gunawan's creation has gone viral for reasons that we can only surmise as effective as it is transcendental. And that alone makes his efforts all the more worthwhile.